I realised when I had this crazy notion of writing about the mass produced lagers that suffer so much craft cognoscenti opprobrium that it would be an irregular feature on Fuggled. 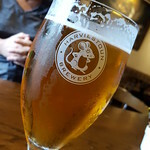 I didn't realise that there would be a year between part three and today's fourth installment, in which I look at a beer that has a storied history, hispter street cred, and is now stable mates with BrewDog. I refer, of course, to Pabst Blue Ribbon. 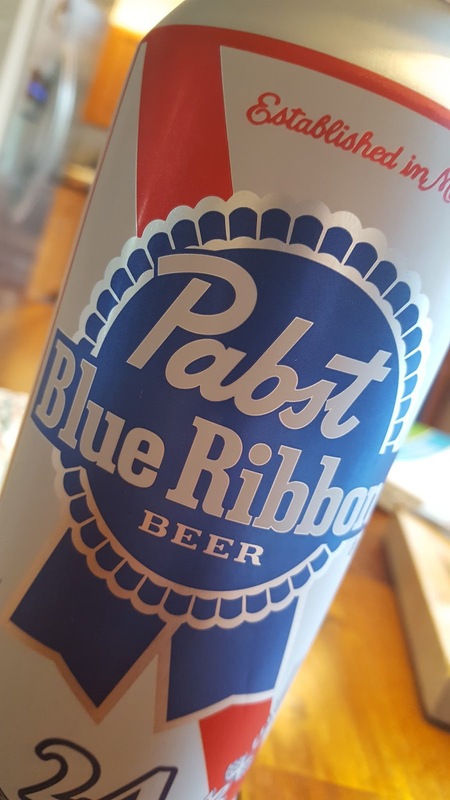 Once upon a time, think late 1970s, Pabst Brewing Company was the third largest in the US but then went into a precipitous decline that saw them in the late 90s brewing less than a million barrels a year. Enter then the heroic hispters, and the brand's revival to the point that in 2015 the company won the GABF's award for best large brewing company. Anyway, enough with the Wikipedia entry details, what about the beer in the can...? Well, it pours a golden yellow not unlike the Heineken from my previous Impartial Pursuit post and sported a surprisingly voluminous, bright, white head. Even more surprising, at least in my mind, was that the head lingered far longer than any of the other mass produced lagers I have tried. In common with the other beers, the aroma was dominated by a cereal character with wisps of lemongrass hops floating about. Tastewise, and again in common with the other beers in the series, it was mainly a rather indistinct grainy flavour with very little discernable hop flavour, overall it was just plain bland, though it didn't have the slick corn character that I was expecting, and neither was it as thin as I imagined it would be. Thankfully it was as clean as I expected, which is always a good sign in a lager. I very much doubt I will be adding to Pabst's bottom line again any time soon, though not because I think the beer is badly made, it quite obviously isn't, but because if I am on the look out for a mass produced lager then Heineken is a couple of steps up in terms of having stuff going on in the flavour and aroma department, and is nowhere near as fizzy as PBR, or Bud/Coors come to think of it. I doubt it will be another full year before I dip into macro beer world again, though I am not sure where to go for the next beer, Miller High Life perhaps? It had been a while since Mrs V and I had gone hiking with our friends Dave and Allie. There are mitigating circumstances though, mainly revolving around Mrs V and Allie being pregnant. We decided though to go on a short hike of only 3 miles yesterday up a mountain called Spy Rock, which has some wonderful views once to you get to the top, having scaled a near sheer rock face to do so, an interesting logistical challenge with 2 pregnant women and 2 dogs. 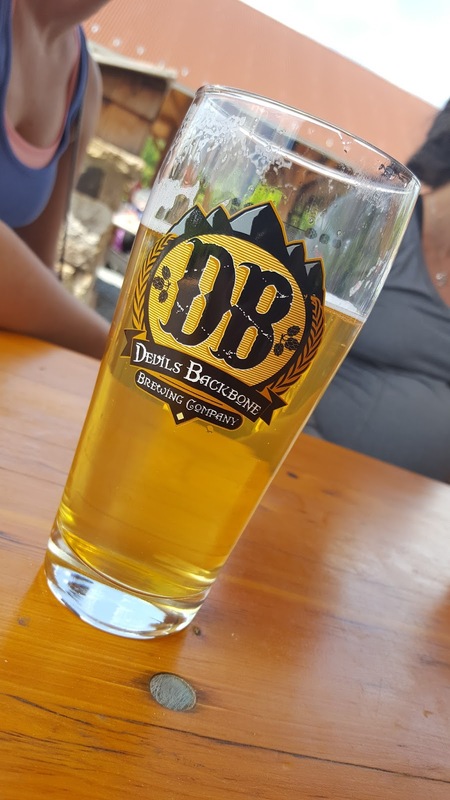 One of the appealing features of choosing Spy Rock was it's proximity to Devils Backbone for a couple of post hike pints, and I was looking forward to sinking a couple of Meadow Biers in short order. Unfortunately when we arrived they didn't have it on tap, though Jason tells me that they recently brewed another batch, so I'll be heading down with growlers to fill for that. They did however have another pale lager that sounded like it would do the trick. Do the trick it did. The beer is called Excel Lager, and as you can see from the picture is a beautiful golden colour, had a nice white head, though slightly diminished by the time I took the pic. In terms of flavour it was everything you would expect from a central European lager; a perfect balance of grain and hop, nicely medium bodied, light honey notes in the background, and a firm but unobtrusive bitterness that demands another mouthful. Both Dave and I polished off our first pint in about 5 minutes. Best of all with this absolutely stunning beer was that it has an ABV of.......2.6%. Yes, you are reading that number correctly, 2.6%. 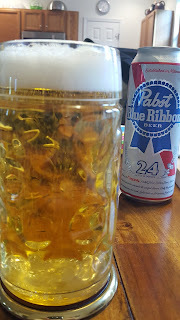 Using a method I learnt in Prague of multiplying ABV by 2.5 to get the approximate starting gravity, I was drinking a 6.5-7° Plato lager, the like of which I could imagine being brewed in a northern Bohemian glass works as refreshment for the workers. 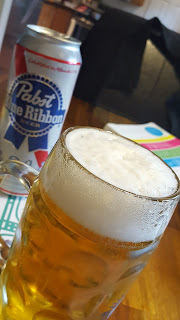 To put this beer in a bit more context, I spent Saturday up in Northern Virginia judging for the Virginia Craft Beer Cup and was handed the Czech lager category. This sedmička would have easily made the top three beers we judged, and would have been a very strong contender for first place, it is that good. However, since Devils Backbone are no longer permitted to participate in the competition by virtue of being owned by Anheuser-Busch, this beer will likely not get the praise and credit it deserves. I have said it many times, anyone can throw boat loads of hops into the kettle and get something the lupulin loonies will lavishly laud to the heavens, but it takes a true master craftsman to create a 2.6% beer that is refreshing and flavourful. Jason Oliver and the crew at Devils Backbone are such masters of the craft. Finally it is May, which of course means that on both sides of the Pond it is Mild Month. Mild Month has been going for a while back home in Blighty, and CAMRA are at the heart of encouraging drinkers to try something a little different this month. Over on this side of the mighty Atlantic, I started American Mild Month in 2015 with the aim of encouraging brewers and drinkers to put down their IPAs and take a walk on the mild side. Unfortunately I've not had as much time to commit to this year's iteration of the project as I would like, day job and all that, but it is good to know that there are plenty of breweries in the US who have taken up the baton and will have milds on tap in May, including several here in Virginia. I hope to find time to scoot around the Old Dominion a bit trying milds from breweries like Three Notch'd, Mad Fox, and the Virginia Beer Company, as well as enjoying the Oliver Ale's Dark Horse sent down for myself and the designer of the American Mild Month logo form Baltimore in Maryland. So let me encourage people to try at least a few pints of mild this month if you see them, and post pictures on Instagram, Twitter, and Facebook with the hashtag #MildMonthUS.